There is no substitute for the experience of visiting the University of Miami campus. If you take the time to visit, you'll see firsthand why students choose to live and learn on our campus. Your visit will start with an information session hosted by an admission counselor to address academics, student life, and the admission and financial aid process. Current students will then lead a tour of our Coral Gables campus. Events are happening on campus and around the country throughout the year. Find the one that's right for you. Take an interactive tour of campus for a look inside UM's classrooms, labs, Shalala Student Center, Richter Library, and other buildings from the comfort of your own home. 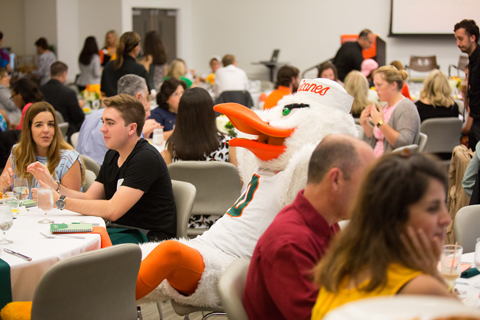 Take a self-guided tour of the University of Miami Coral Gables campus. Stop by the Undergraduate Admission Office to pick up our campus map and follow our suggested path. We accommodate special visits for high school organizations. Reach out to us to schedule your group tour. The University of Miami’s unique geographic location affords students a broad range of opportunities. Visit us to get to know us better.